The Eberlestock F4M Terminator is an extremely versatile full-format load bearing pack. Optimized for the scout/sniper mission, it has a unique articulating rear interior wall that allows a weapon to be carried near the wearer's back. When not carrying a weapon, the wall is pressed against the frame to maximize conventional interior load space. 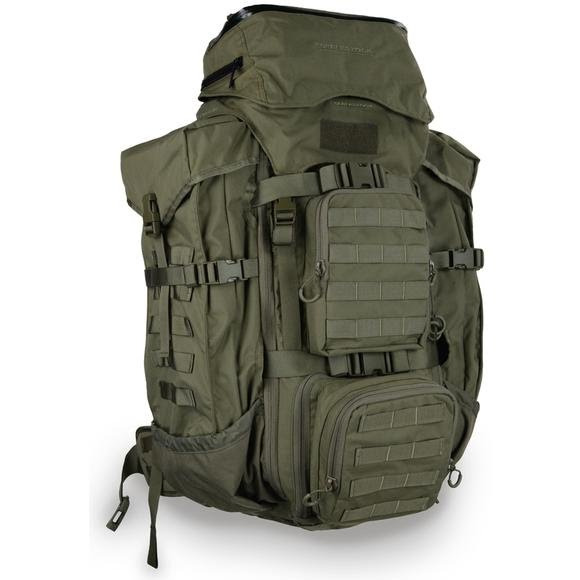 The Eberlestock F4M Terminator is an extremely versatile full-format load bearing pack. Optimized for the scout/sniper mission, it has a unique articulating rear interior wall that allows a weapon to be carried near the wearer&apos;s back. When not carrying a weapon, the wall is pressed against the frame to maximize conventional interior load space. The F4M is laid out much like the G4M Operator, but instead of a built-in weapon carrier, the pack is a conventional pack with configurable load bay. The weapons bay puts the weapon next to the wearer&apos;s body, and when used with the optional A4SS Tactical Weapon Carrier, all man-portable sniper rifles can be carried. The pack is also compatible with A1SS, A2SS, and A2LS Side Scabbards. A4SS Side Scabbard is a configurable weapon carrier, capable of being rigged to contain virtually any man-portable weapon. It links to the F4M pack&apos;s main frame panel. Once I got over the price, I couldn't be more pleased with the product. The design, quality all the way down to the way it feels on my back made me forget about what I paid for the product. This will be something I have and use for many years.